Last month I shared with you my eight most favorite gardening books and showed you past posts that described them. Now I'd like to do the same thing with gardening products. These are the things other than seeds that I use over and over which were either a one-time cost or their value justifies the cost for me. Under each picture I will describe it and link to any past posts about it. I have been using this a lot lately. You can see me in action using it on this post. I love it because with it allows me to work on my seedlings at the kitchen table or even on the coffee table without making a mess. 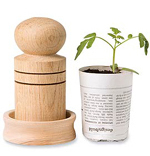 Made popular by my favorite gardener, Eliot Coleman , Soil block makers are so cool. I am using mine more and more to plant tomatoes and beans. I especially like using it for delicate plants like corn! great bell peppers and Great Big Tomatoes helps to grow pretty amazing tomatoes! I actually got to work weekends at Gardens Alive in 1996 and have been using some kind of Gardens Alive fertilizer ever since. I have had success with Vegetables Alive!, Tomatoes Alive!, Sweet Corn Alive! and Strawberries Alive! I couldn't do without row covers. In an organic garden the light weight insect barriers are a great protection to brassicas and squash. The heavyweight row covers really help with frost protection in spring and fall. This nylon trellis netting is perfect for climbing vegetables. I use it with wood or pvc trellises for cucumbers, peas and pole beans. It is very strong and has 4" openings - big enough to reach through. And the cost is under $5 for a 5'x15' piece . Even though this is at the end of the list, it is probably my favorite thing on the page. I'm so glad I bought one of these. My worms take care of our table scraps and have given us lots of vermicompost. This Worm Factory system actually makes it fun to compost with worms. Coir is a lot like peat, but since it is coconut husk fibers, its more renewable than peat. I learned about it from the book that comes with the Worm Factory. See it in action here. It's great to use with worms, but I also use it in my Topsy Turvy Tomato Planters and other places. 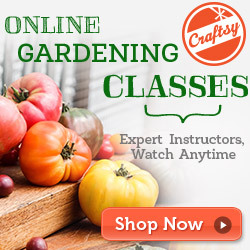 These eight products aren't the only things I use in the garden. They are simply the things that I've noticed I use time and time again and enjoy using. 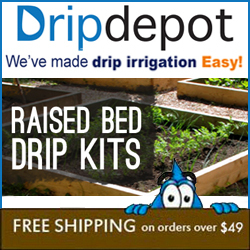 I'd love to hear if you have any products like this that make your gardening life easier. Now I just can't wait to get out in the garden and use some of these!